"The enormous economic growth in China has been accompanied by radical social change. Cities and communities have been transformed in a single decade. This capitalist expansion has been matched by an explosion in the art market for Chinese contemporary art. Curators from all over the world have been beating a path to studios in Beijing, Shanghai and various auction rooms around the world". Review - Sainsbury Centre. There was both a feeling of upliftment and sadness at the exhibition 'China China China'. There was a radical feeling of escape, of the death of the old and rebirth and of the opportunity for these contemporary artists to make a statement to the West. Their art has been described as 'cynical or critical realism'. Suddenly Chinese art has become desirable making the work of previously unknown artists extremely valuable, freeing them to show their art to the world. 'Artificial Moon', by Wang Yu Yang, 2007. 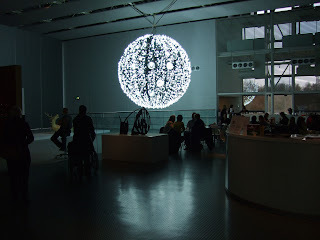 This large piece is created by using a variety of different low energy light bulbs. Diameter 400 cms. It is an impressive piece, to me depicting newness, lighting the way to a new future. 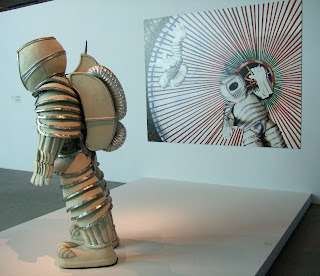 'The first infant who cries aloud is Teimuzhen' - part of 'Nomadic Plan in Outer Space' by Wu Ershen, 2008. 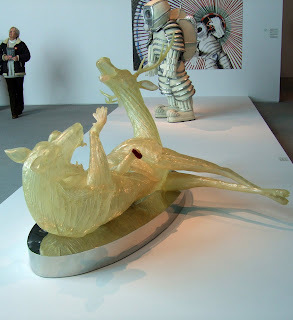 There is little explanation of these pieces but again, this piece depicts co-creation between the wolf and the deer. In the centre of this piece, out of the pain, a baby's hand can be seen possibly reaching into the new world of China. 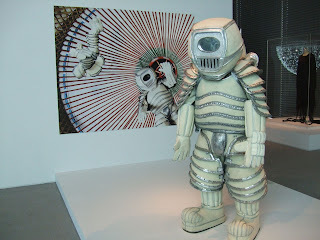 Part of 'Nomadic plan in Outer Space', a futuristic piece also looking back at the life of Ghengis Khan. The horse and figures are made from Nomadic fabric, probably felt. 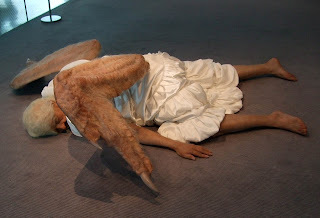 'Life-like and sad, the elderly angel lies in a final peaceful moment on the floor. 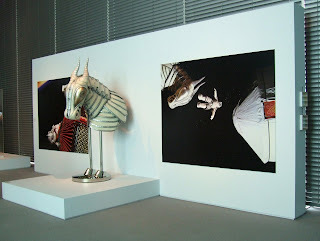 For cutarors, the relationship between an art work, its concepts and the venue in which it is shown is always interesting, and here this work not only relates to the chinese Art economy phenomenon, but also to the issue of the human body as an object, and Chinese and UK societies concerns with the elderly, perhaps loss of power, capability and vitality, the fact being that the elder society will be the future issue in 10 years'. This work certainly evoked emotion from the crowds. The 'body' is created from fibre-reiforced polymer and silica gel and is so realistic, we were convinced that if we tickled his toes, he would flinch. There were hairs, scabs, wrinkles and blemished on his arms and legs, a fascinating piece which again seemed to depict the fall of the old in China. The face looked as if he would open his eyes at any moment. Part of the Saachi collection. Most of the other exhibits were videos and some I could not watch. One was about the killing of animals. A fascinating video by a North Korean who decided to return to his home town to see how things had changed was almost like being part of his emotional journey. He found extreme poverty and corruption. The lengthy piece was filled with interesting images and shocking awareness of the repression, poverty and control in N. Korea. The border between North Korea and China is a narrow river. When the levels are low, North Koreans escape across the border. Using ropes to pull little tied bags across the river, exchanges of cigarettes, alcohol clothing etc. are made with the border guards. He showed that when the river froze in the winter, it was littered with footprints of those seeking refuge in China. I couldn't help leaving the exhibition valuing our freedom.